For edx.org courses, you enter this information in Publisher. For more information, see Creating a Course in Publisher. For courses on Edge, you enter this content in Studio. For more information, see Creating a New Course in Studio. The course card on edx.org. The program page, if the course is part of a program. New course images must be 1134 x 675 pixels in size. However, only part of this image may be visible. The viewable area varies according to the web page where the viewer sees the image. The following example course image is 1134 x 675 pixels. 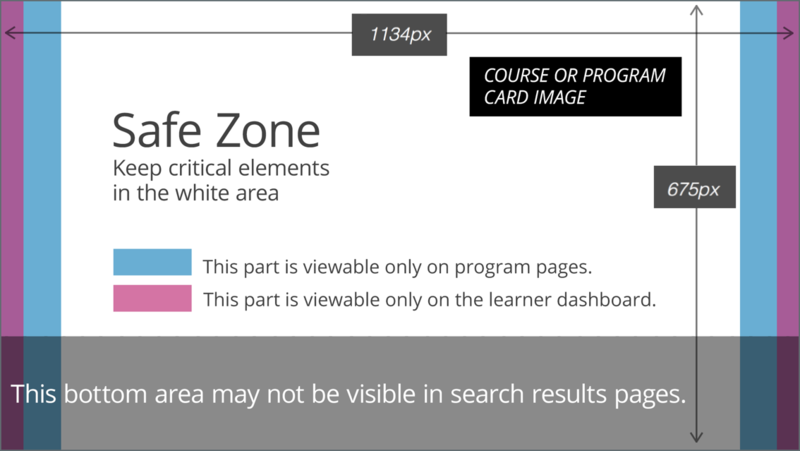 The image shows the area of a course image that is always visible, as well as the areas that are also visible on different pages. You can click to enlarge the image. For courses that had a first run before December 2017, image sizes of 2120 x 1192 pixels and 378 x 225 pixels are supported. However, we strongly recommend that you update your course image size to 1134 x 675 pixels. The program image size must be 1440 x 260 pixels. However, only part of this image may be visible. The viewable area varies according to the web page where the viewer sees the image. The following example program image is 1440 x 260 pixels. The image shows the area of a program image that is always visible, as well as the areas that are also visible on different pages. You can click to enlarge the image. For courses on edx.org, when you add an About video for a course, you must first upload the video to the edX/Veda video upload page. You can then optionally enter the URL for your course About video in Publisher. For more information, see Add a Course or Program About Video and Create a Course in Publisher. For courses on Edge, see Add a Course About Video for information about how to add an About video to your course About page.